This three part necklace now comes with a handwoven silver chain of over 500 hand-fused links made by my partner, Holly Troy. The chain is 16″ long, and as a piece of jewelry, stands out on its own. The three pieces of the pendant were made to be worn together, or separately, whatever your mood or the occasion. 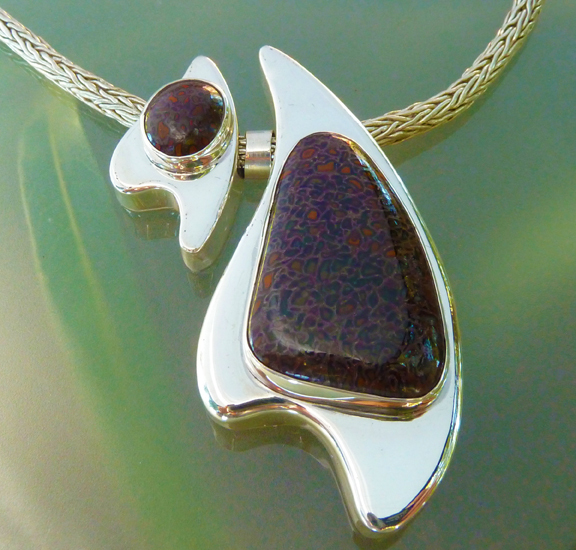 The two “pendants” are hollow forms, and the dinosaur bone comes from Southern Arizona. The dinosaur bone is a rich, earthy red brown mixed with flecks of red, rust, gold and purple set against polished silver.